Background: PTSG was commissioned by Heathrow maintenance contractor, Carillion, to upgrade eight monorail-based cleaning systems on the Terminal 5 building. 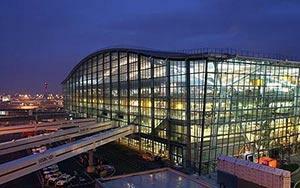 Results: Used by 28.1 million passengers every year, Heathrow’s iconic Terminal 5 is one of London’s busiest buildings. The largest free-standing building in the UK, its glass facades are cleaned using eight monorail-based cleaning cradles. Maintenance contractor, Carillion, commissioned PTSG to remove, overhaul and replace all eight systems and provide all necessary re-commissioning work and insurance checks. The location, at one of the world’s busiest airport terminals, placed a number of constraints on the work. To avoid peak passenger times, work could only take place in the early mornings between 1am and 4am; and because of the location of the equipment in high-security areas, only BAA-certified engineers were permitted to carry out the work. With such a small time window in which to work, PTSG back room staff played a key role in providing clear and concise instructions to engineers, arranging permits and carrying out risk assessments in advance. Despite these challenges, the project was successfully completed within three weeks.